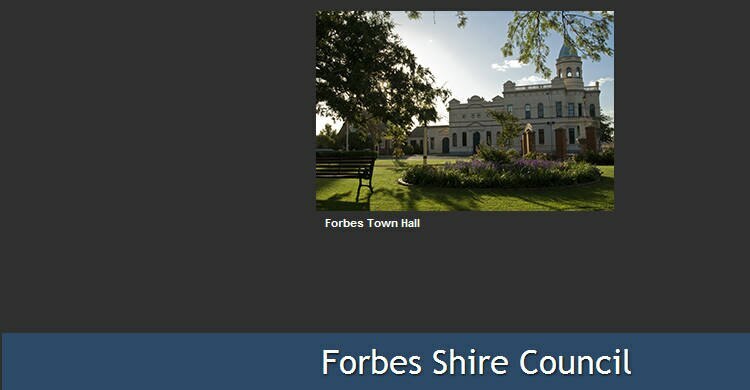 Forbes Shire Council was created in 1981 from the amalgamation of the Forbes Municipal Council and the Jemalong Shire Council. Council is responsible for town planning, building approvals, local roads, parking, public toilets, water and sewerage, waste removal, domestic animals and community facilities. Local taxes (called rates) are collected from home owners based on the value of their home. These taxes are used to pay for the services provided. Under the slogan 'FRIENDLY, HISTORIC, INVITING', Forbes has flourished in recent years and its infrastructure has been developed to cater for an increasing number of tourists. Situated in the heart of the Lachlan Valley, the Forbes Shire is regarded as one of the richest primary producing areas in the state. The district's history of white settlement goes back to the 1800s, when John Oxley ventured through the region. A colourful period began with the discovery of gold in 1861, bringing tens of thousands of people to the diggings. Fabulously rich strikes were made, but the goldfields also attracted those who sought treasure by easier means. We invite you to come and experience our country hospitality, heritage, beautiful natural environment and distinctive local attractions. History will come alive as you explore our town and learn of its gold rush past. Experience Lake Forbes and the Lachlan River or a spectacular sunrise or sunset at the acclaimed Gum Swamp Wildlife Refuge. Email forbes@forbes.nsw.gov.auto order your copy today. Forbes Shire Council endeavours to provide up to date information regarding services available to the community. Don't forget to check out our 'Regular Events' brochure on our Events page to see what exciting things are happening in our town.